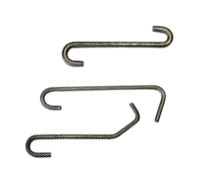 Element Hangers | Industrial Furnace Interiors, Inc.
Hangers or anchors can be made to match existing parts, or custom designed specific to your application. Ceramics can be incorporated into the hanger to provide isolation from the heating elements. We offer element hangers and anchoring systems for most applications including fiber modules, firebrick, and refractory furnace linings. Contact us today to determine the best hanger or anchor system design for your application.